The mimosa absolute is obtained from Acacia decurrens, a native of Australia. The absolute is extracted from the flowers and twig ends through solvent extraction. Mimosa is a thick, yellow material with a sweet, floral and slightly woody aroma. Aromatherapists use it to calm and relieve anxiety. Its cosmetic applications stem from its astringent and antiseptic properties. The flowers are harvested in March and April, when they are in full bloom. This absolute is a hard and sticky substance. Before it can be added to a product, it has to be heated to soften it a little. Mimosa absolute has to be handled with care. If it sticks to you, it can be a nightmare to get off! 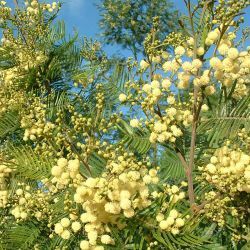 In a skincare product, mimosa absolute would be used for its astringent qualities, cleansing the skin of dirt and grime. We use mimosa absolute in our Seanik solid shampoo bar for its antiseptic effect and beautiful fragrance.